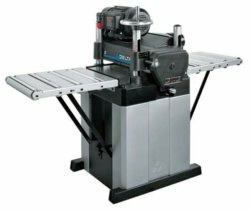 There are currently three different Delta planer models on the market, ranging from a 13" portable planer to a big 24" industrial-duty stationary model. All come with a 5-year warranty and get above average reviews. Delta has been through several mergers and acquisitions over the years, and at the moment (04/2013) is a subsidiary of Chang Type Industrial Co. Delta Power Equipment's headquarters and manufacturing facility is currently located in Anderson, South Carolina. 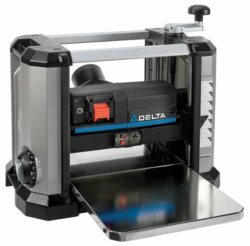 Delta woodworking tools overall are known to be good quality, reliable machines, and their woodworking planers stand up to the Delta reputation. Below, you will find information on the three current models first, but below that I have reviews of a couple of models that have been discontinued since this article was originally written. First up we have the newest version of the portable Delta planer, the 22-590. The Delta 22-590 is a 13" benchtop planer with a 6" height capacity. It has a 15 amp motor and three reversible double-edged knives. It also has a 4-column cutterhead support, plus a cutterhead lock that helps reduce snipe. There is an infinite micro-adjustable depth stop, and infeed/outfeed tables that fold up for transport or storage. There are still a few complaints of snipe with the 22-590 Delta planer, but they are not as prevalent as they were with the (now discontinued) TP305. The only other complaint I found was that several people had an issue with the drive belt failing, sometimes taking the belt guard out with it. One owner found that the belt failure was caused by his motor being misaligned. He reports that he loosened the screws and shifted the motor slightly to bring it into alignment, and the new belt is working fine now. The Delta 22-590 is priced in the same league as the Dewalt DW735X (regarded as the benchmark in portable planers) and it has similar features, except the Dewalt has two speeds and the Delta only has one. The Dewalt has better ratings overall, and has been available longer, but the Delta comes with a 5 year warranty instead of Dewalt's 3 year warranty. The other two current Delta planers are industrial models. I won't go into much detail here, because these are not likely to be found in very many hobbyist's shops. 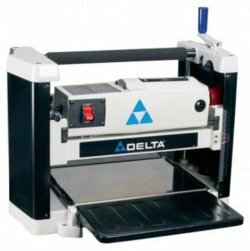 The big Delta planers are in the $4000 - $5000 price range on Amazon at the time of this writing, and are designed for business use. All three have an 8-5/8" height capacity, 3 knives, and two speeds. They are heavy, in the 800 - 1000 lb. range, with cast iron tables. The 22-450 is a 20" planer with a 5HP 220/440V motor that runs on three phase power. The "Big Dog" of the Delta planer lineup is the 22-470, which has a 24" width capacity with a 7.5HP three-phase motor. It has a single four-star review on Amazon. I was not able to find any comments about the big Delta planers on the woodworking forums or on other retail websites. The Delta TP305 was their entry-level portable planer. It has a 12-1/2" width capacity, and a 6" height capacity. The TP305 comes with a 15 amp motor, and the cutterhead has two double-edged knives that can be flipped over when the first edge gets dull. It has a 4-post cutterhead support with a stock-return roller on top, and comes with both infeed and outfeed extension tables that can be folded up when not in use. The entry-level Delta planer was designed for the hobbyist on a budget. It was in the same general price range as the Ryobi AP1301 (see our Ryobi Planers page), which was its main competition. The Delta TP305 had a slightly better average rating than the Ryobi, and also had a 5 year warranty instead of the Ryobi's 3 year warranty. Owners are quite happy with the smoothness of the finish they get from the TP305. In fact, I did not find one single complaint about the quality of the finish. WOOD Magazine said the little Delta planer produced the best cut among sub-$300 planers in their March 2010 issue where they tested 11 different benchtop planers. Reports of failures are also few and far between. I only found two, and both of those owners admitted they overworked the machine and really needed a heavier-duty unit. Owners say the blades hold up very well and are easy to change when needed. The most frequent complaint for the Delta TP305 is that is produces snipe on the ends of the board. However, snipe in varying degrees is the most common complaint I have found for ALL of the benchtop planers I have researched, no matter which brand or model. A number of owners have managed to reduce or eliminate snipe using the proper technique, while others have not been successful. Most owners manage to work around it and have accepted that it kind of comes with the territory of a portable planer. - I have the little Delta planer and love it for what it is. I have planed thousands of board feet on one side of the knives. I am just about ready to flip them over after 3 years of owning it. The only complaint I have is that mine snipes, but I can work around a couple inches of snipe on my boards. - D.
The Delta TP305 works very well for the average hobbyist or for light-duty jobsite work, but it is not designed to be run for long periods of time or for taking heavy-duty cuts. For that, you need a heavier-duty and much more expensive machine. I believe the ratings would be somewhat higher if all the folks who bought one realized that you can't expect an entry-level planer to perform the same as machines that cost 2-3 times as much. As long as you are using the TP305 as it was intended, it performs well and is a great value. If you need a little more capacity than a benchtop planer can provide and you don't need it to be portable, the (now discontinued) Delta 22-790X could be the answer. The 22-790X is for the serious hobbyist, or the professional that doesn't need a big industrial-size machine. It is in a completely different class than the portable planers above. The 22-790X is a stationary machine with a 3HP, 220V motor and a closed stand. It has a 15" width capacity and a 6-1/2" height capacity, and uses three single-edge knives that can be resharpened. The 22-790X Delta planer has an oil-bath gearbox with two speeds. It is similar in design to the 16" Jet JWP-16OS, but has a closed stand and longer infeed and outfeed supports. Owners who are tight on space really like the fact that the infeed and outfeed extensions will fold down when not in use. One advantage this machine has over many of the larger stationary planers is that the cutterhead assembly moves up and down, while the bed stays at the same height. If you are planing really long stock that requires additional supports, the additional supports can be left at the same height all the time with a fixed bed, whereas a planer with a moving bed requires you to constantly adjust the height of the additional supports. I wasn't able to locate any forum comments about the 22-790X. I also didn't find any real complaints, either. Owners are happy with it overall, and it is much better at hogging off large amounts of wood than any of the benchtop planers. Bottom line, if you are looking for a good-quality planer, the Delta 22-590 is a great choice. At the time of this writing, it is priced a little lower than the Dewalt 735X, offers similar quality, and the Delta planer comes with a 5-year warranty. To get specs on the current Delta planer models, visit the Delta Tools website.